Thinking about cutting costs by switching to email archiving and management in the cloud, but not sure how it all adds up? Understand the different ways Mimecast saves you time and money and put figures on what your own cost savings will be. Can using Software-as-a-Service be cheaper than running the equivalent software in-house? Yes, especially when one service can replace multiple software tools for you. But will it actually be cheaper for your business and how can you work out the savings? 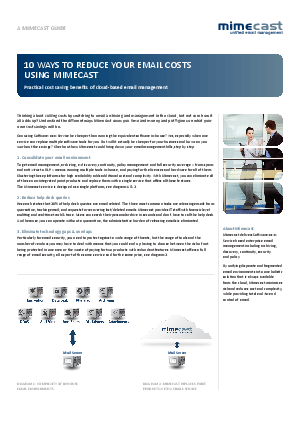 Check out how Mimecast could bring down your email management bills, step by step.